I had to clean out my in laws’ Windows laptop this weekend, and this was my first major contact with Windows in weeks, outside of testing IE6 quirks on Parallels. The horror that is Sharepoint is only a distant memory. Even more distant (and not as unpleasant) memory of MS Commerce Server surfaced recently. 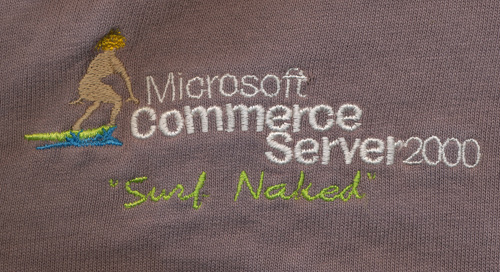 I received this shirt as a gift from Microsoft developers, some of whom actually wrote major parts of Commerce Server and Site Server when I visited Redmond. They were very competent, knowledgeable and sociable. I remember being surprised by seeing a lot of Perl books in one office, and being told that for parsing log files even the mighty Beast of Redmond relied on Perl. I did not get to see Lake Bill or the Microsoft museum, but I did have a Blibbet Burger at the cafeteria. My favorite piece of swag was this polo shirt which I almost completely wore out. It is about to completely disintegrate, so I decided to scan the logo from it.